Inspired by local Essex boy, Jamie Oliver. 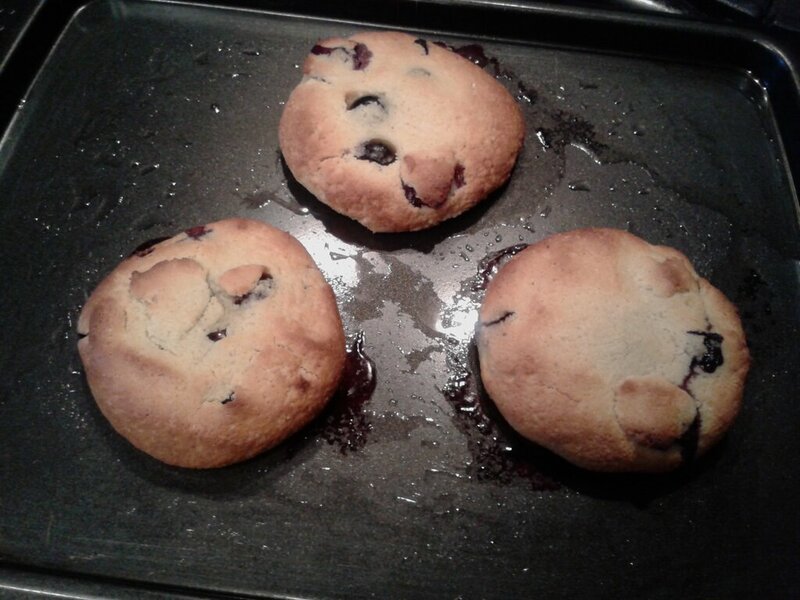 He has some good ideas, particularly if you like rustic food and can’t be bothered with fussing over presentation. Rustic food needs to be phographed well but as always, I can’t be bothered. If you try this recipe out, do send in some pictures inshaaAllaah. In a small bowl mix all the ingredients together but NOT the prawns and egg. In another small bowl, lightly whisk the egg. 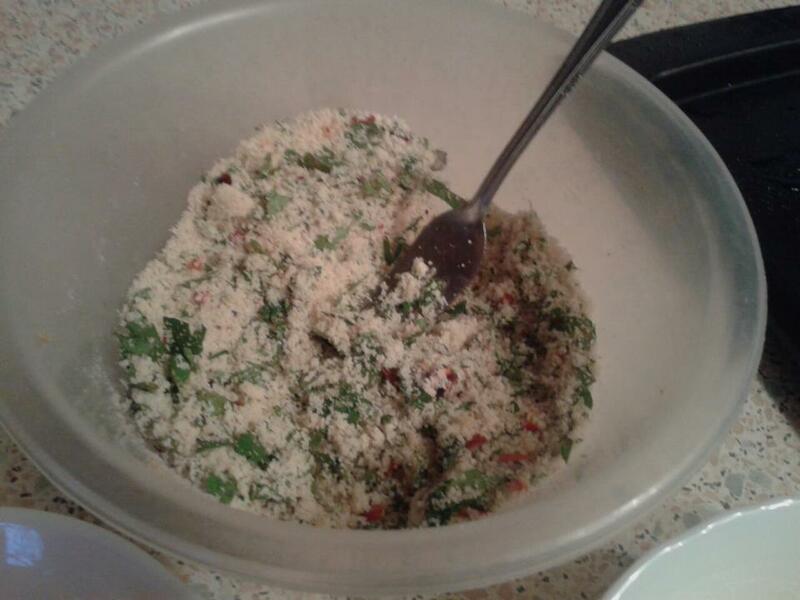 Dip the prawns into the egg and then place them into the ground almond mix. Remember to use one egg for adding the prawns to the eggs and then putting the eggy prawns into the ground almond mix. Then use the other hand to cover the eggy prawns with the dry mix. Use separate hands to avoid eggy-almond hands. 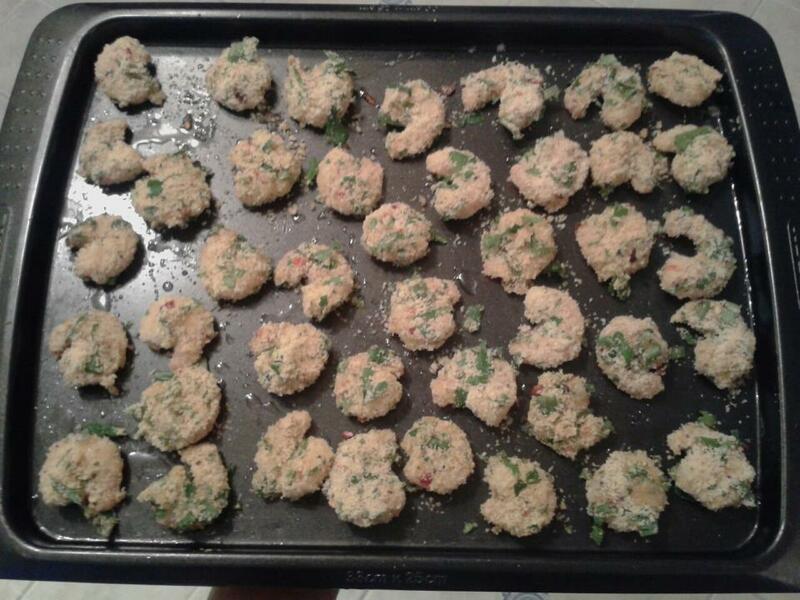 Place them on a non-stick tray and very lightly spray this with oil. Pop the prawns in the oven for approximately 12-15 minutes mak on gas mark 4 and you should turn them half way through to give them a nice even ‘tan’. 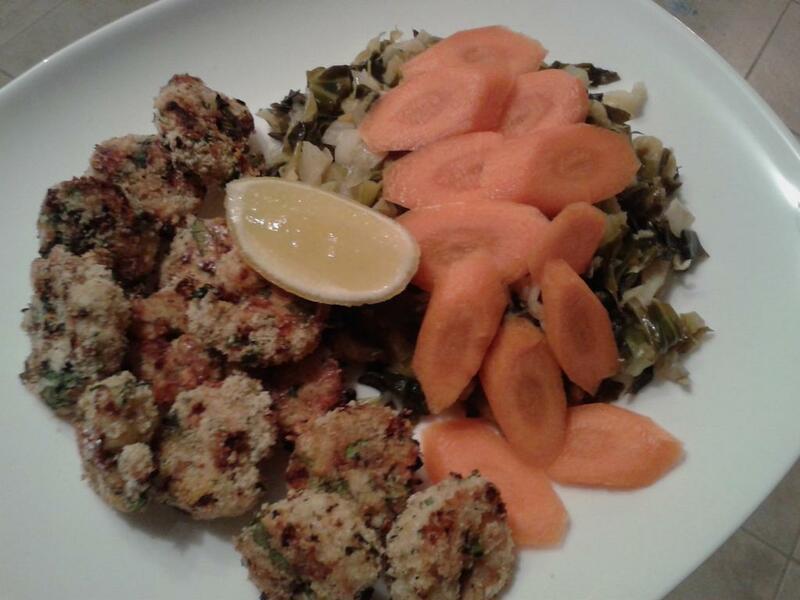 Serve with veg and a nice wedge of lemon. Squeezing fresh lemon juice on top of these prawns is just delicious! Dished up ready to eat! Remember to add loads of lemon – yum! I’m quite fussy when it comes to grapes. I don’t mind seeds but I have to say crunchy, crispy grapes are the best. I know I like crunchy and crispy foods but honestly, squidgy, over-ripe grapes aren’t the same. Unless they’re Italian grapes. Italian grapes are quite large and tend to come in bigger bunches, sadly supermarkets don’t really stock them as far as I’ve seen. They’re also sweeter and juicier. I’ve had grapes for breakfast on numerous occasions. The best way to have them, I think is sliced in half (green and red/black grapes) with a drizzle of honey and a squeeze of lemon or lime juice. And you can top it with a tiny amount of fresh corriander or parsley if you want. Of course you can just have it as a snack too. I sometimes add watermelon, galia melon, yellow melon or honey dew melon to the mix if I have some handy. Blood cholesterol. Pterostilbene , a compound present in grapes helps lower the cholesterol level. Saponins in grape skin prevents the absorption of cholesterol by binding with it. Alzheimer’s disease. Resveratrol in grapes reduces the levels of amyloidal-beta peptides in patients with Alzheimer’s disease. Grapes can enhance brain health and delay the onset of neurodegenerative diseases. Kidney disorders. Grapes reduce the acidity of the uric acid and help eliminate the acid from the system thus reducing the pressure of the kidneys. Heart disease. Grapes increase the nitric oxide levels in the blood which prevents blood clots thus reducing heart attack incidents. Antioxidants in grapes prevent the oxidation of LDL cholesterol, which blocks the blood vessels. Indigestion. Grapes prevent dyspepsia. They cure indigestion and irritation of the stomach. Anticancer properties. Resveratrol acts as anti-inflammatory. Effective in breast and colorectal cancers. Anthocyanins and proanthocyanidins have properties of anti-proliferate which can inhibit the growth of cancer causing agents. Prevents cataract. Flavonoids in grapes reduce the damage caused by free radicals such as cataract apart from age related problems, heart disease and cancer. Macular degeneration is age related loss of vision. Studies suggest 3 servings of grapes daily to lower the risk of macular degeneration by over 36%. Asthma. Due to the high assimilatory power of grapes, moisture present in lungs increases. Grapes have therapeutic value for asthma. Breast cancer. In a recent study, purple colored Concord grape juice helps prevent breast cancer. Experiment was conducted on laboratory rats. There was a significant reduction in breast tumor mass after they were fed the grape juice on the experimental basis. Fatigue. It’s not the dark grape juice that gives an iron boost it’s the light and white grape juice that prevents fatigue because it replenishes the iron content in the body. So go for the light and white grape juice for boost not the dark one. Antibacterial activity. Red grapes contain antibacterial and antiviral properties to protect you from infections. Its antiviral property is effective against poliovirus and herpes simplex virus. I mentioned yesterday how I was going for a blood test, I had this gluten sensitivity/coeliac disease blood test form from Sept 2012 when I was told to consume gluten for 10 days straight in order to be tested. I decided against it and later discovered that gluten can lurk about for up to 6 months or something so figured I could have a blood test now. Plus with all these negative remarks about a paleo diet (because I eat fat and I’m not afraid of it!) I figured it was time for me to personally bust a few myths like “you’re cholesterol will be high” and so on. I want to prove paleo is a diet that everyone should adopt. Mostly because of the health benefits but also because it is a part of our Deen, Islaam (See previous post and download the audio inshaaAllaah). If you follow me on Facebook you’ll also see that I’m expecting a raw milk delivery tomorrow inshaaAllaah… so excited! I’ll post more about this in the coming days, that is, the benefits of raw milk and what has been mentioned about it in the Sunnah. Yes, dairy is not a paleo food, however I can see why – when we’re talking about supermarket dairy and similar! Raw milk on the other hand is full of goodness, I doubt anyone can deny it having done some research. So I’m going to revive this Sunnah and take care of myself properly inshaaAllaah. So anyway, I was hungry last night after a very early and very light dinner. Fasting for this blood test did not help and after that I went food shopping. Hungry old me bought an array of fruit, veg and meat and then I was stumped about what to have for breakfast. I eventually decided on a beefy omelette type thing after reading the Barefoot Coconut’s Facebook post whilst I was sat in the waiting room of the blood test centre. I came up with a new concoction: a stuffed omelette calzone. Aptly named because it contains a stuffing, the outer bit is made using an omelette and the shape or concept of it resembles a calzone. You know, the semi-circle stuffed pizza thing. I apologise in advance for my lack of measurements. As usual I eyeball everything and today’s mixture should make 3 small omelette-calzones or 2 normalish sized ones. It depends on the size of your frying pan – I use a smaller than normal one! 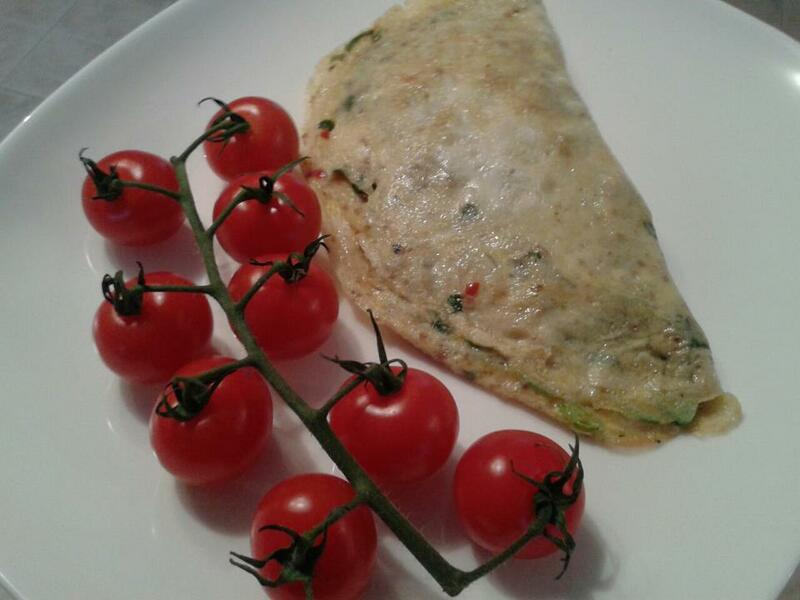 Omelette, whish all ingredients in a small bowl. It’s not rocket science really. See images below and captions for further instructions. 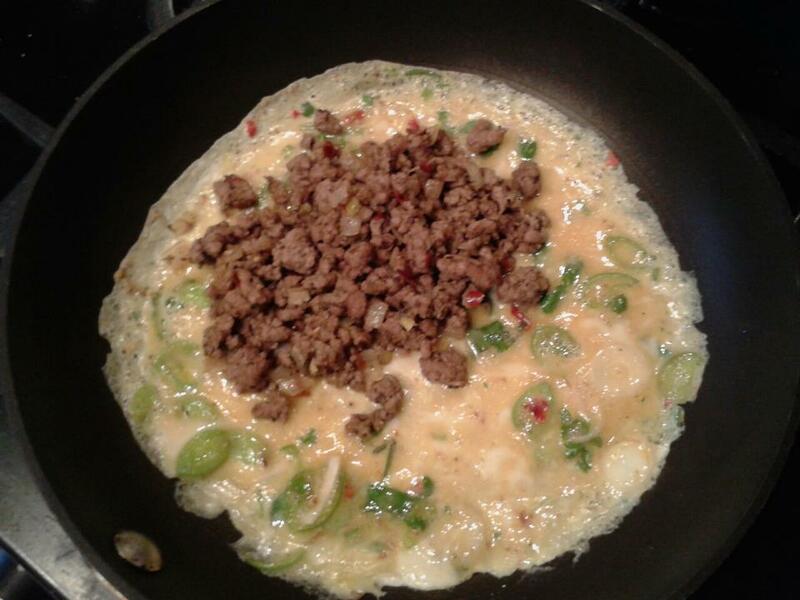 As the omelette cooks through, add soem mince beef mix to one half. 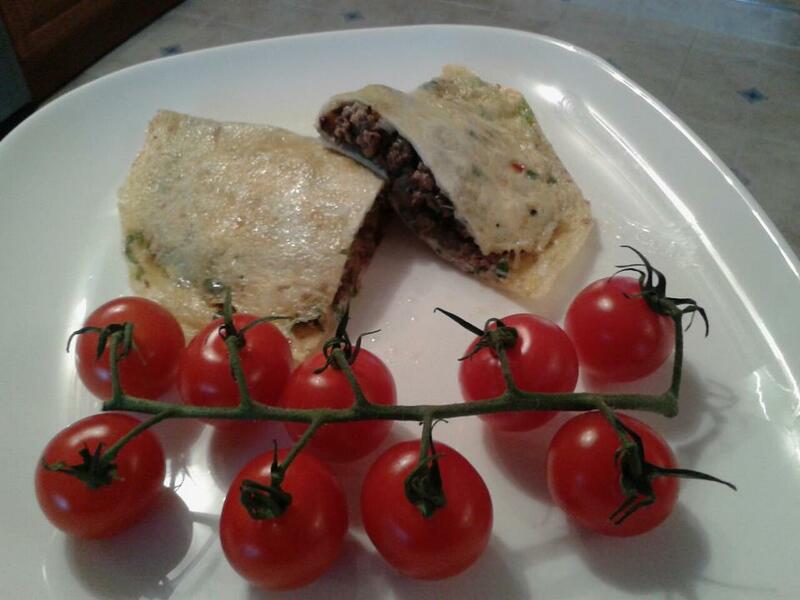 Leave a ‘border’ so when you fold the other half of the omelette over it seals the stuffing in. The omelette needs to be wet still otherwise it won’t stick and seal when you fold it. 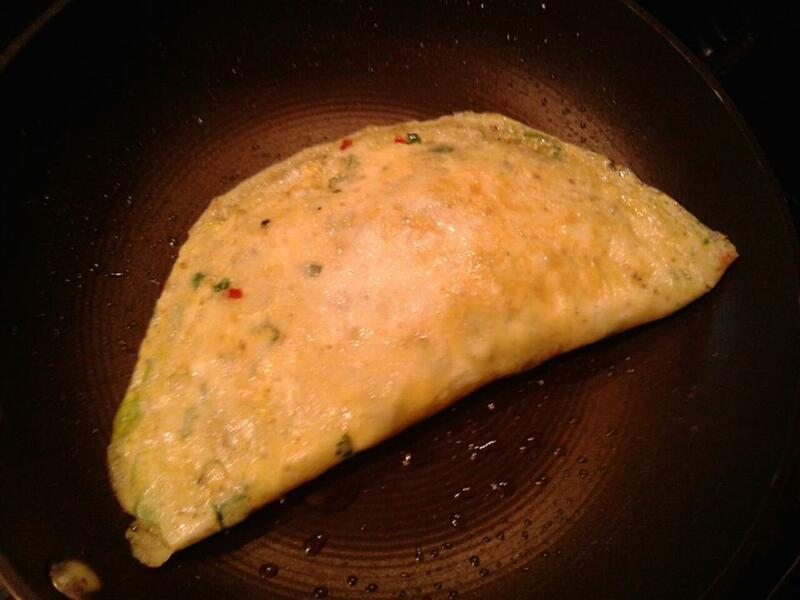 The omelette should be sealed once you’ve folded it. If the stuffing’s spilling out you’ve probably added too much. Helps to turn the gas off at this stage if you’re a little slow with it.